There’s a new kid on the block that is as ancient as civilization. Wild peas were foraged and consumed dating back to 9750 B.C.E., though they were not cultivated until thousands of years later. Today, a forward thinking, agro-industrial environmental entrepreneur and imagineer, (Eli) Paris Winston has breathed new life into this super food through innovative cultivation, milling and packaging practices. With a long and varied repertoire, the self-made Winston has long relied on his keen eye to leverage hidden opportunities, whether as a young man in South America, or closer to home in big manufacturing. Now, in a joint venture with Dr. Iain Cleator, a brilliant surgeon and health researcher, the once-private Winston is bringing the same brand of innovation to organic farming through Churchill Global International. Amongst their offerings is pea flour, which when augmented with a small amount of rice flour, can replace wheat flour in any recipe, rendering recipes gluten free and offering a complete plant-based protein containing all essential amino acids. It promotes healthy digestion and nutrition, changing how our bodies make us feel and the way we think about the food we eat. In searching for a superior choice of super food infused goodness for my exquisite Sweet Potato Pecan Pancake recipe, I found much more than I had bargained for. I found a pea flour education. I also found that Churchill Global’s yellow pea flour is not yet on the market for retail sale, but they hope to have it available in the future. I wrote to Mr. Winston and asked him if I could get samples in order to test my pancake recipe. I am happy to report the success of my tests and present to you a photo of the fruits of my quest. 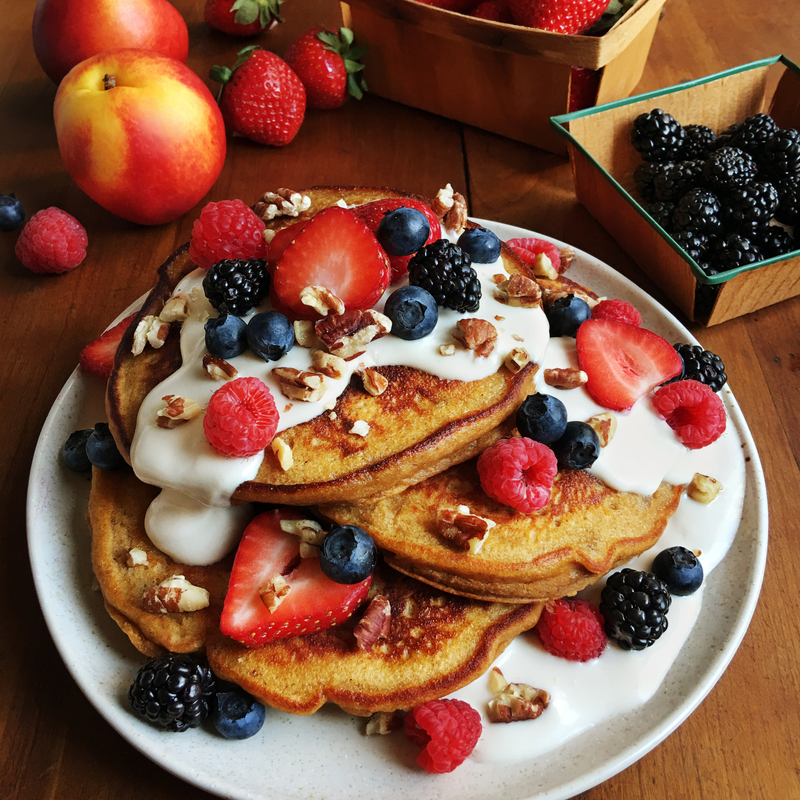 My recipe for Sweet Potato Pecan Pea Flour Pancakes with a Maple Yogurt Goat Cheese Sauce is graced with just the right amount of sweetness to tickle your fancy, yet has a low glycemic index. It has lots of fiber and nutrients from the delicious wholesome ingredients and makes an impressive presentation when topped with your favorite fruits. Marilinda Hodgdon is a renowned New York-based food stylist and chef. She has freelanced for the top food corporations, ad agencies, TV production companies, and photographers all over the world since 1978. Marilinda grew up in an Italian family with a strong focus on organically grown homemade foods. She started cooking at the age of five and became head cook at an Italian restaurant at the age of sixteen. She received her BFA from UGA and did postgraduate work at Cal State. She studied art in Tuscany and experienced the culinary delights of her Italian origins first hand. Marilinda has appeared on the Food Network shows Chef at Large and TV’s Greatest Food Moments, as well as the Discovery Channel program Daily Planet. She has been featured on Fox News’ Good Day America for her food styling and was recently featured on ABC News (abcnews.go.com/Lifestyle/linguine- whisperers/story?id=23145244). She is currently developing Red Fife wheat recipes for Churchill Global International.